Globally Inspired, Locally Sourced- Island Cuisine & Hospitality. Located in the Historic Kensington Train Station C. 1905 we warmly welcome our guest year-round show casing the best our local farmers & brew masters have to offer. Cozy indoor seating and sunny patio dining available. Enjoy the freshest oysters the Island has to offer. Serving our very own Malpeque oysters and focusing on the freshest local ingredients. Malpeque Oyster Barn offers fresh daily specials and friendly service and is family owned and operated. 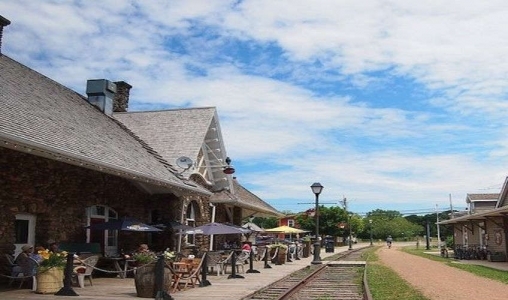 Located on the Wharf overlooking the Malpeque Harbour. Enjoy your meal in a casual environment with unbelievable views. Open June 10th – Sept. 10th. Prince Edward Aqua Farms Inc. Prince Edward Aqua Farms Inc. has been growing, harvesting, and processing fresh shellfish since 1989. Farm raised blue mussels, Malpeque oysters, wild and farmed, soft shelled steamer clams, hard shelled clams, little necks, top necks, cherrystones, and quahogs. We are HACCP certified, SQF certified, BAP certified, and organic certified. Shipping year round to North America. Once you set foot into this award-winning eatery, it becomes apparent why it has become a destination restaurant. The Pearl strives towards excellence, with the philosophy that sharing a meal that is fresh and creative is simply the way it should be. Open mid June - mid October.